There is a litany of strange and bewildering customs on Jura but maybe the one regarding the Ankh cross demands the greatest attention. This ancient symbol dates back to Egyptian times and is long rumoured to bring good fortune. Just so long as you pour the whisky in the correct manner, by holding the bottle with the Ankh cross in the centre of your palm. Lightly peated with hints of smoke and spice. 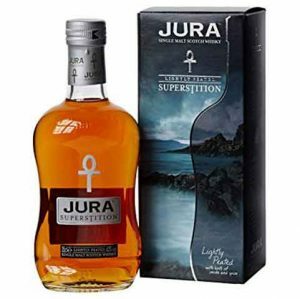 Although no age statement, Superstition includes whisky matured up to the age of 21 years. 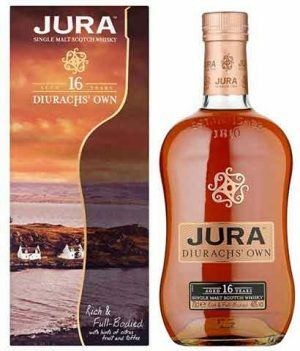 Nurtured for sixteen long years, this is the whisky of choice for the people of Jura. It's a subtle malt - unassuming, understated yet intriguing. Qualities often attributed to the Diurachs themselves. Understandably, the islanders are drawn to it above all others. To honour this unique bond, the symbol of the Diurachs adorns each and every pack. 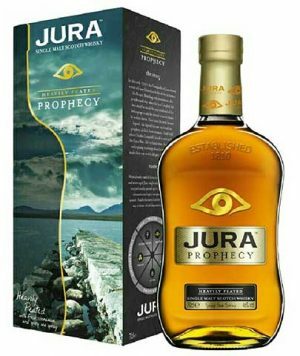 In the 1700's the Campbells of Jura evicted a wise old seer. Bristling with resentment, she prophesised that the last Campbell to leave the island would be one-eyed with his belongings carried in a cart drawn by a lone white horse. Over time the story became legend and the prophecy drifted from memory. Until 1938, when Charles Campbell, blind in one eye from the Great War, fell on hard times and led his white horse to the old pier for the last time. Heavily peated with fresh cinnamon and spicy sea spray. 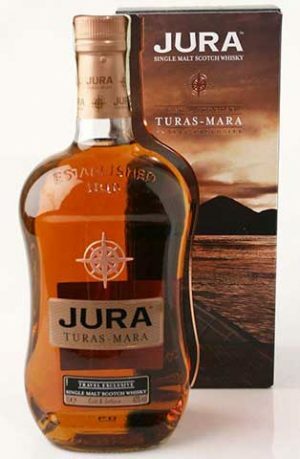 A 20 year old limited edition, small batch special release from Jura to celebrate Jura's community. Matured in American White Oak ex-bourbon barrels specially prepared with Jura, aged in Sherry wood, Sparkling Cabernet Franc casks, Cabernet Sauvignon casks and Pinot Noir barriques. Bottled in September 2017 at 51% abv, non chill filtered and with no added colour. 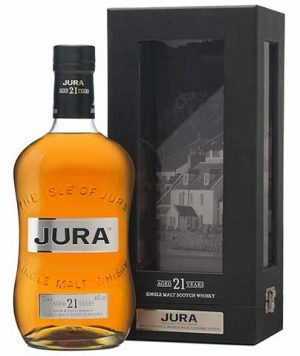 Jura 21 year old was discontinued in 2009, but is now back in limited quantity at 44% abv. Initially released to celebrate the distilleries 200 th anniversary, it is now part of their core range. Matured in ex-Bourbon barrels then finished in Oloroso sherry casks. 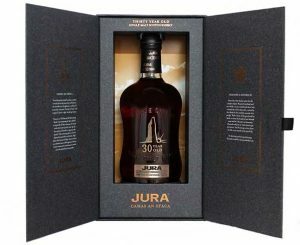 "medium long finish, pleasantly dry, with some oaky notes, winter spice and bittersweet nuts"
This 30 year old Jura single malt scotch is a work of art. The bottle carries a design of the Camas an Staca ancient standing stone for good reason. It symbolises the passage of time. And just like the stone itself, this 30 year old expression has waited long and patiently. A malt that will truly stand the test of time. Much like the Camas an Staca itself. 27 long years in American white oak, and a final three in the finest Amoroso sherry casks, have crafted a masterpiece. The choice of first fill American white oak casks gives this liquid notes of orange and tangy liquorice. It is then transfered into the finest Amoroso sherry casks for its final maturation. 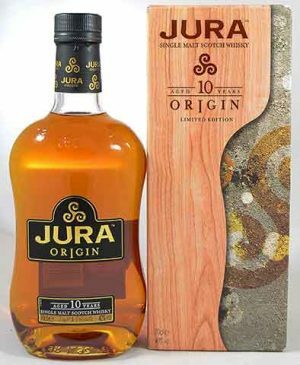 "An intense blend of Morello cherry, plum jam and earth allspice"
Jura 10, 'Origin', is aged in ex-Bourbon casks for 10 years. Light and delicate with a warming honey finish. 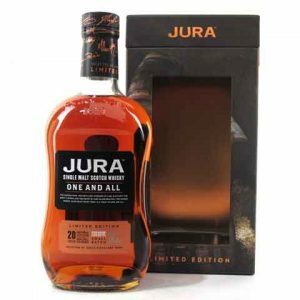 "oak with hints of honey, caramel and soft liquorice"
A heavily peated example of Jura bottled by Signatory as part of their Cask Strength Collection. Distilled on 17 December 1989, matured in two bourbon barrels for 26 years, then bottled on 10 June 2016. 338 bottles produced.